An elegant addition to the Isabella range, this occasional sofa is perfect for intimate conversation or soulful contemplation. Shown here upholstered in Metaphores Zig Zag Jacquard Poudre, with legs in ebonised walnut. Construction: solid seasoned beech frame, sprung seat and channeled back. Each Stuart Scott piece is built by hand in our workshop in Wiltshire, England. Nothing is mass-produced. This ensures complete attention to detail, structural integrity and sheer build quality. We never compromise. When we finish each piece, it is signed and numbered: a unique handmade masterpiece. Registered design no. 4042937. Available in a carefully curated range of Zig Zag colours (5 colours). Customers can also choose from the following feet finishes: Oak - Oiled, Aged or Ebonised. Walnut - Oiled, Ebonised or Black lacquered. 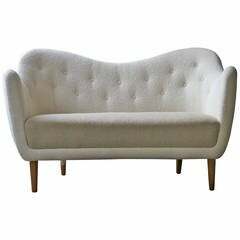 Rare and gorgeous Hans Wegner armless three-seat sofa with tubular steel legs and upholstered in a gorgeous light grey woven Crypton fabric. Very unique. A 180cm sofa by Front Design in leather with embroidered pattern. Made from injected polyurethane foam over a steel structure. Feet are in tubular black steel.